Today’s guest post has me thinking (again!) about my kitchen. Whilst I don’t think gloss kitchen doors are for me, or maybe anyone with small children, I do like how they can reflect the light and make a space seem bigger. Lots more lovely tips in this article. Enjoy! Many of us dream of a spacious country kitchen with enough room to prepare food and entertain guests. However, the reality of the situation is that this type of kitchen is extremely hard to come by, with homeowners having to pay a premium for extra kitchen space. Does this mean that you have to give up your dream? Absolutely not. This article will highlight a handful of kitchen design ideas perfect for those with small kitchens, enabling you to create a space that meets your cooking ambitions. If space is a little tight then why not think upward? An efficient way to use your kitchen space is to extend the height of your kitchen cabinets, making full use of the vertical space. Kitchen cabinets should be thin and narrow with glass panels to maximise the illusion of additional space. A Kitchen Island is your Saviour! A kitchen island is the essential piece of furniture necessary to transform your small kitchen space. If your kitchen is lacking storage, then this can be your saviour! Investing in a kitchen island will reduce the amount of often wasted floor space, whilst maximising much needed cooking and storage space. Incorporating gloss finished kitchen doors provides your kitchen with a distinctive finish whilst being right on trend. Not only do they look great, but glossy units are a wonderful idea if you’re trying to maximise your kitchen space. Due to their reflective surface, this enables natural light to bounce around the room giving the illusion of a larger space. Shop with a supplier that allows you create custom units that fit your kitchen perfectly. You may feel that because you haven’t got the space, you don’t have the opportunity to express your personality when designing your kitchen. Although this is somewhat correct, adding a splash of colour can be the ideal way to put your stamp on the kitchen and if used cleverly, colour can give the impression of more space. For example, adding a bold block of colour to a feature wall or simply opting for coloured gloss kitchen doors. An ideal solution to your storage dilemmas is to utilise the empty wall space in your kitchen. For example, hanging rails for utensils help maximise space by making full use of normally empty walls. A quick tip is to focus on the wall above the sink; I bet it’s currently empty! Although this is not necessarily a solution that’s available to everyone, opening up your kitchen by fitting French doors will allow you to bring the outside in, making a cramped area seem a lot more spacious. French doors essentially allow you to extend your kitchen into the garden whilst enabling an abundance of natural light to regularly enter the room. Clever lighting solutions can embrace the space that’s already there, whilst making rooms of all shapes and sizes feel bigger and brighter. Installing task lighting for worktops and cooking areas enables you to illuminate those dark spots, creating the illusion of more space. Feature lights can also be used to accentuate open shelving and floor lighting is a clever way to open up a narrow walkway. When used in conjunction with light-reflecting materials (such as the high gloss mentioned above) your kitchen will be brighter and seem spacious. Author Bio: Janet Walker regularly writes on a variety of home related topics, with a specific interest in kitchen design. Janet works for Doors Sincerely, specialists in wardrobe and kitchens doors. Interesting tips, thanks for sharing! It’s actually surprising the effect that a few changes can make to the perception of a room. Thank you for the very interesting post. I especially like the part about incorporating gloss finished doors in kitchen design to make a kitchen look larger. This is especially helpful for people living in flats or townhouses where space is usually limited. Using the upward space is such a great idea. Hardly anyone knows how to make use of that vacant space in their house. Love your post so much and I definitely will come back to read others. Excellent advice. I wish I had the time to do this when we were building our home.This is especially ideal for people residing in apartments or townhouse where space is usually limited. Much obliged to you for the extremely intriguing post. I particularly like the part about consolidating shine completed entryways in kitchen configuration to make a kitchen look bigger. Some interesting ideas you have shared.I loved them!! I was planning to renovate my kitchen..Thanks for the ideas..
Pantry cabinets is another solution. Get pantries with roll out shelves they will fit a lot of dishes and pots and pans. Top shelves use for long storage or cans and so on. Thank you Jen, for sharing this helpful post. I never thought that colour can also give the impression of more space. I would remember it while renovate my own kitchen. Thanks again. My Kitchen is smaller than you can imagine. These are really helpful tips for renovation work. 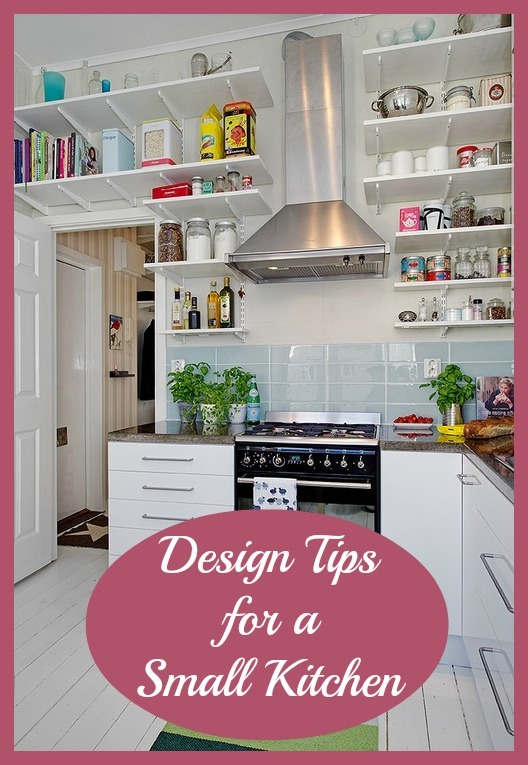 Thank you for the very interesting post.Just terrific small kitchen decorating ideas.